One of the hallmarks and great strengths of the Episcopal Church is that we vote. We use our minds and hearts to consider the issues, we listen for the Holy Spirit among us, and then we vote—at parish annual meetings, at diocesan convention, at meetings of councils and committees and, once every three years, at General Convention. Like any democracy, we don’t always get it right, and there are votes recorded through Episcopal history that now make us hang our heads with regret and shame. More often, however, our votes advance the cause of social justice, provide initiative and money for vital mission and ministry and help the church stand in solidarity with the poor. is comprised of no less than 10 and no more than 12 members elected by the Cathedral at its annual meeting and divided into three equal classes with staggered three-year terms and eligible to serve for three consecutive terms. includes ex-officio representation from the Chair and Vice-Chair of the proposed Cathedral Council. Both have seat and voice, but only one has the privilege of vote at any single meeting. works with staff, committees, and the Vestry to make recommendations regarding the budget and programs of the Cathedral’s mission, outreach, community ministry, and congregational life. 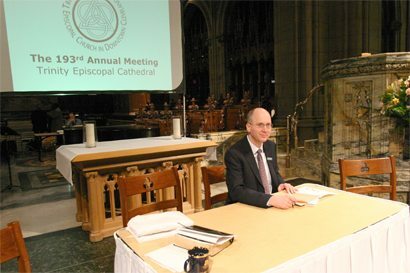 Nominees for Vestry, Cathedral Council, delegates to the Diocese of Ohio’s annual convention and certain members of the Nominating Committee are chosen through a broadly representative and thorough nominating process that results in non-contested elections at the annual meeting. We believe this leadership discernment, development, and nominating process broadens Trinity’s base of trained, committed lay leaders. two members elected at the Annual Meeting. The Nominating Committee convenes each March, discerns the needs of the Vestry and Cathedral Council, solicits applications from the congregation, seeks out well-qualified candidates, and presents a non-contested slate for consideration by the congregation at the Annual Meeting.